Is Windows Phone 8 Keyboard better than other smartphone Keyboards? Here’s an interesting Mobile App or in fact a programming environment on your Windows Phone device that lets you to write scripts using your Windows Phone. 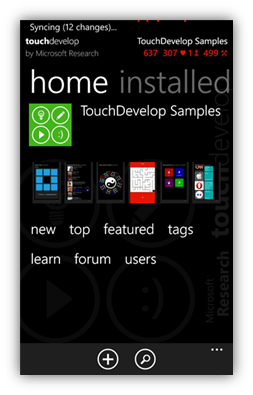 The Windows Phone app TouchDevelop helps you to create apps on your phone and also lets you share with other people. You write the programs by just tapping on the screen. Simple isn’t it? The App is published by Microsoft Corporation and is available for Windows Phone 7, Windows Phone 7.5 and Windows Phone 8 users. The current version of the TouchDevelop is 2.11.0.0.